Alvena Oldman stands in front of the Arapaho flag at the Wind River Tribal College in Ethete, Wyoming. Photo by Jonathan Barela, Northern Arapaho Public Relations Department The Arapaho language, like most remaining Native American languages, is on the brink of disappearing. Scholars and community leaders estimate that fewer than 200 people on the Northern Arapaho reservation now speak it as a first language, and they are almost all over 50 years old. If this language is to survive, it must be learned and spoken by young people. And that's precisely Alvena Oldman's mission in life. She is the director of the new Hinono'eitiino'oowu language immersion grade school on the Wind River reservation in Wyoming, which just opened on October 17. Alvena and her fellow elders have a plan to give the Arapaho language to their youngest relatives entering elementary school—kindergarten and first grade students—and they will not be held back, even by "the big dollar sign," Alvena says matter-of-factly from her office at the Wind River Tribal College in Ethete. She and her peers have claimed a portion of the tribe's annual budget, and they are bringing in local business support for the school as well. They want to ensure that in 50 years their language will still be spoken in their descendants' daily lives and in the ceremonial rites marking the passage of time, generations of leadership, and the cultural survival of their people. Hinono'eitiino'oowu, "The Arapaho Language Lodge" is slated to expand by one or two grade levels each year for the next five, to ensure that children learn about their identity as Arapaho people. "We have the [Arapaho] flag song in the morning," says Alvena, "followed by lessons and illustrations to teach basic vocabulary: simple everyday nouns followed by action verbs and descriptive adverbs. In the afternoon we sit them around in a circle and talk in the language about what they learned in the morning." Alvena credits the Northern Arapaho Business Council, which passed a resolution in support of language preservation and revitalization, as well as the Council of Elders, which approved the five-year plan to expand the school to upper grades. "This is something they've been talking about for years and years now, and we've finally gotten it going," she says proudly. The Council of Elders has gathered nearly $400,000 in funding support for the school's inaugural year, including contributions from the tribally operated casino, and from other tribal governments such as the Yavapai, Miccosukee and Cheyenne/Arapaho nations. The school actually started classes even before the building was opened in October. Beginning in August, two teachers worked side-by-side in a local church building, donated for the school's temporary use while volunteer contractors put the finishing touches—new interior walls, painting and carpet—on an old tribal office building located behind Great Plains Hall in Arapaho, Wyoming. One teacher is a fluent speaker, the other a language learner, and between their skill sets they deftly guide 19 five and six year olds through their daily lessons in a language that they themselves were punished and discouraged from using in their own youth. Alvena’s voice softens as she recalls begging her cousins, in Arapaho, to take her home when they first began attending the local mission schools on Wind River. "My cousins still tease me about that," she says, "because I said it over and over." She didn't know any English to understand what the teachers were teaching every day, but she knew her language wasn't welcome when those around her were punished. "They'd just come and hit our hand with a ruler," she says, or "sometimes they would take them in the back room" when the youngsters slipped up and called out to each other in Arapaho. "It was really hard for me because all I knew was my Arapaho language, so I kept telling them to take me home because I was scared." Very quickly she understood: "You do not speak your language while you're in this school." There are 19 children currently enrolled in the K-1classes, as well as 14 preschool students who share the facility. Alvena is certain that more parents will enroll their youngsters now that the school has moved into its larger facility. "Each day we're getting new applications," she says. 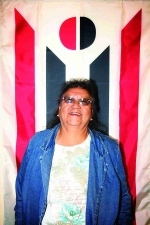 An experienced administrator and program manager, Alvena studied business administration at Haskell Indian Nations University, Casper Junior College, and Wind River Tribal College, and worked for 12 years administering public-assistance and social-services programs, including food stamps for needy families—her “first career,” she chuckles. “I took an early retirement when my husband passed on, but that didn’t work.” Soon after, Wind River’s language revitalization efforts took off, and she’s been involved ever since. The challenges ahead are great: maintaining the school’s funding at over $350,000 annually and acquiring new funds for grade-level expansions up to grade eight. But the tribe’s leadership is committed, and local groups are supporting the effort: the Council of Elders; the tribe’s governing body, the Northern Arapaho Business Council, and its finance and human resources departments; the tribal Language and Culture Commission; and of course, 200 first-language Arapaho speakers, and the medicine and sun dance societies and extended families led by the Beesneni’teeno’, the elders. Called the Wrong Rooters, Blue Cloud People, Cloud Men, and the Arapaho by other tribal nations, they call themselves “Our People, the Sky People,” says Alvena, and preserving those names, those memories, those histories of diplomacy and interaction with both outsiders and allies is part of why Arapaho Language Lodge is so badly needed on Wind River. “In our age group,” she says, “there's too many leaving, and they take our language and whatever cultural things they know with them. I want to do what I can to help my people bring back our language and hold on to whatever we can—to keep it alive." Jennifer Weston is the program officer for Cultural Survival’s Native Language Revitalization Campaign.